1. Credit supply/demand fundamentals are trending in the positive direction. Loan demand has improved dramatically and credit standards are looser than at any time since the Great Recession. 2. Since the conclusion of ECB's stress tests in early 2014 (which had been a major source of uncertainty for banks in 2013), loan balances in the Eurozone are beginning to stabilize. Corporate loans are still declining (as maturing loans are not being fully replaced by new loans) but at a much slower rate. These improvements are of course dwarfed by credit expansion in the US where loan balances are growing at over 8% per year (see chart). 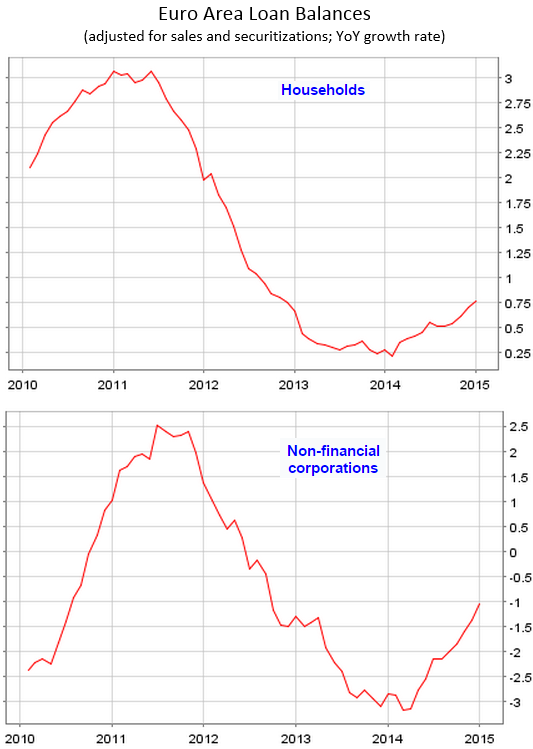 Nevertheless, the painful deleveraging process in the euro area's banking system is coming to an end. 3. Lending rates in the Eurozone periphery are declining sharply. The so-called "monetary transmission" of zero ECB policy rate into rates paid by borrowers is still not great, but the process is starting to work. 4. Corporate capital markets flows in the EU have jumped recently and a number of Eurozone-based companies will benefit from this trend. 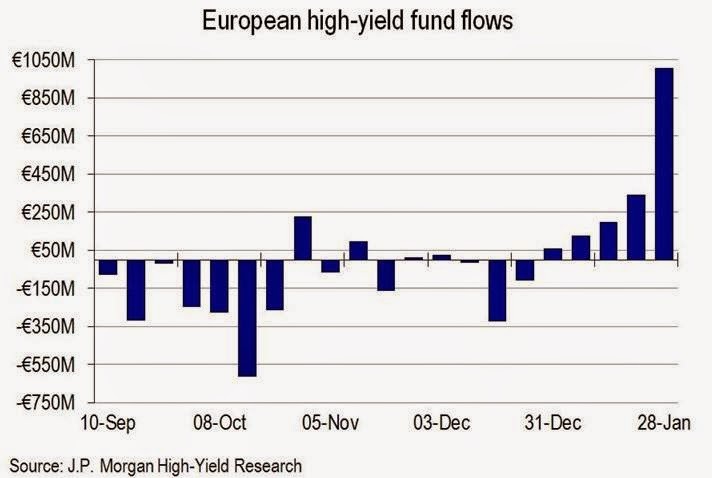 Cash-rich euro area investors are shopping for yield and now there is some demand from the corporate sector. 5. Perhaps the best indicator of credit expansion and diminishing effects of bank deleveraging is the growth in the Eurozone's broad money supply. The improvements which followed the ECB's stress tests have been impressive. Why then do we need such an aggressive monetary response from the ECB? 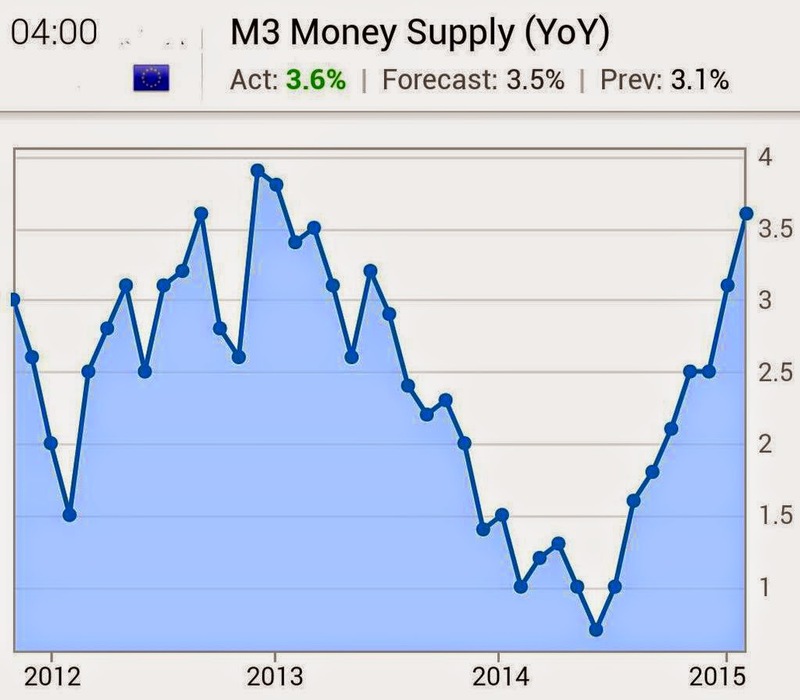 The answer has to do with rising deflationary risks in the euro area. While some have associated falling inflation with sharp declines in energy prices, the issue in the Eurozone is broader than energy (see "core" CPI). And deflation could easily extinguish this nascent improvement in credit. Clearly the area faces significant headwinds such as the mess related to Greece. 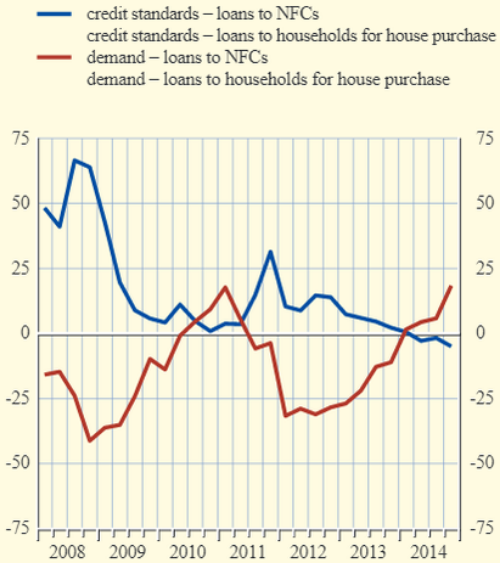 Rising probability of "Grexit" for example could dampen lending in other nations. The improvements to date however have been impressive and should not be ignored.